Aims: This study aims to demonstrate the bone regeneration in the periapical region using platelet-rich fibrin (PRF) and nanocrystalline hydroxyapatite (NcHA) with collagen in combination with PRF and their effects on healing in periapical tissues. 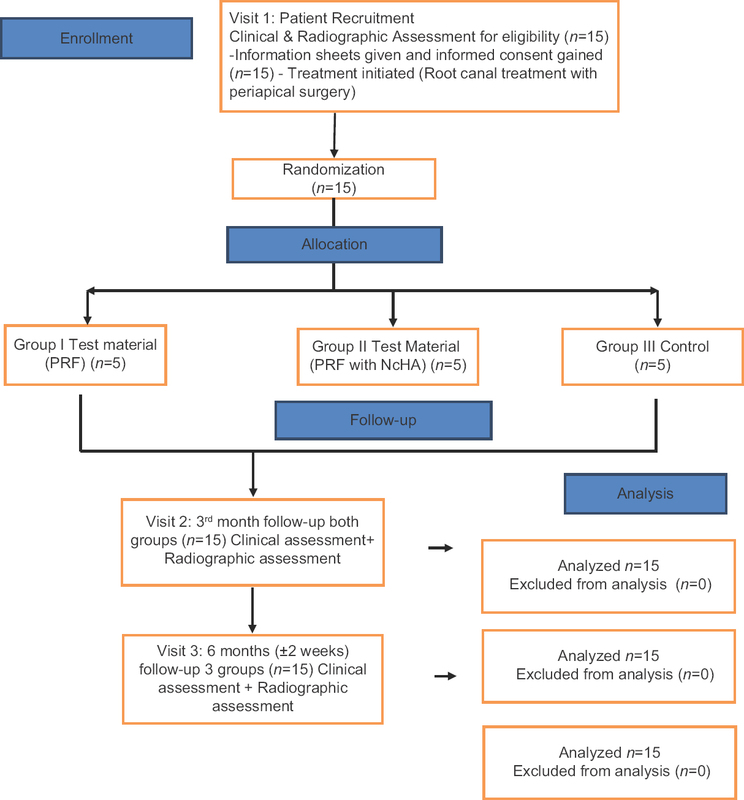 Subjects and Methods: Fourteen patients (15 surgical sites) were selected and distributed into three groups: Group I – Replacement with PRF, Group II – Replacement with PRF and NcHA with collagen bone graft (SYBO GRAF – C, Eucare pharmaceuticals ltd., Chennai, Tamil Nadu, India), and Group III – Control group. In all the three groups, patient recall visits were scheduled after 1-, 3-, and 6-month time interval for clinical and radiological examination. Radiovisiography image was analyzed using RADIANT Digital Imaging and Communications in Medicine VIEWER. Results: A significantly higher rate of healing was observed after 6 months in Group II (100%) followed by Group I (92%) and Group III (86%). Conclusion: It was concluded that combination of PRF and nanocrystalline hydroxyapatite with collagen produced a significantly faster bone regeneration. The conventional technique and PRF were less predictable with its healing response. Periapical lesion is a sequel of endodontic infection. Destruction of periapical tissue results due to encounter between microbial factors and host defense forces at the interface between necrotic root canal and periodontal tissue; this results in inflammation and resorption of mineralized tissues. Regeneration of periapical bone defects is a great challenge to endodontist, especially in case of large bony defects or through-and-through lesions. Surgical intervention is not the first choice, it is undertaken after unsuccessful conventional endodontic treatment, and it also depends on the size of the lesion. Various bone graft and regenerative materials are used in periapical surgery, but key to tissue regeneration is to stimulate a coordinated healing events which can result in integrated tissue formation. Whether the damaged tissues heal by regeneration or repair depends on the availability of cell types needed and the presence or absence of signals necessary to stimulate these cells. The tissue engineering approach to bone regeneration combines three elements which include stem cells or progenitor cells, conductive scaffolds or extracellular matrix, and signaling molecules. Bone replacement material should be biocompatible, noncarcinogenic, and dimensionally stable. It should serve as a scaffold for bone formation and slowly resorb to permit the formation of the new bone. Nanocrystalline hydroxyapatite (NcHA) is one of the promising biomaterial for bone healing and regeneration. Several case reports have demonstrated healing with the formation of mature bone using this bone graft. Platelet-rich fibrin (PRF) is a second-generation platelet concentrate which is rich source of growth factors and its application is effective way for inducing tissue repair and regeneration. PRF preparation generates a fibrin network similar to natural process; such network helps in more efficient cell migration and proliferation. PRF is osteoinductive, and HA with collagen is osteoconductive. Hence, the combination has synergistic effect on bone regeneration. Clinical data reveal that it will be a favorable matrix for excellent healing without excess inflammation. Various studies have shown clinical success of both materials when used separately. The purpose of this study was to evaluate healing after periapical surgery using PRF and NcHA with collagen in combination with PRF. The study protocol was evaluated and approved by Institutional Human Ethics Committee (IHEC-0031). The procedure was explained to the patients in their own language, and informed consent was obtained from them. Fourteen patients (15 surgical sites), aged between 20 and 50 years, were included. The procedure was explained to the patients in their own language, and informed consent was obtained from them. The selected cases included those in which conventional endodontic therapy failed to resolve the problem, periradicular lesion that cannot be resolved with an orthograde endodontic approach, apical lesions >10 mm, and through-and-through lesions. Preoperative radiograph of the tooth was taken, and size of the radiolucency of the concerned tooth was measured using radiant Digital Imaging and Communications in Medicine (DICOM) VIEWER. Lesion >12 mm are assigned to Group I, through-and-through and large cystic lesions are assigned to Group II, and lesion <10 mm are assigned to Group III. The patients were divided into 3 groups of five patients each: Group I – Replacement with PRF, Group II – Replacement with PRF and NcHA with collagen bone graft (SYBO GRAF – C, Eucare pharmaceuticals Ltd., Chennai, Tamil Nadu, India), and Group III – Control group. The first step of the treatment plan was to complete the root canal therapy in cases where dry canals existed, and in others, obturation was done on the day of surgery. Prebiotics was prescribed. The surgical protocol included a routine medical history followed by blood investigations. Intra- and extra-oral antisepsis was performed using 0.2% chlorhexidine digluconate rinse and povidone iodine solution, respectively. Following administration of local anesthesia, sulcular incision followed by two vertical relieving incisions were given and a full thickness mucoperiosteal flap was reflected. Debridement of tissues at the defect site was followed by irrigation with sterile saline and povidone iodine. Ten milliliter of intravenous blood (by venipuncturing of the antecubital vein) was drawn from the patient. Whole blood was drawn into the tubes without anticoagulant and immediately centrifuged at 3000 rpm for 10 mins in the Department of Biochemistry, RMMCH. Within few minutes, the absence of anticoagulant allows activation of the majority of platelets contained in the sample to trigger a coagulation cascade. The result is a fibrin clot containing the platelets located in the middle of the tube, just between the red blood cell layer at the bottom and acellular plasma (platelet-poor plasma [PPP]) at the top. PRF was easily separated from red corpuscles base (preserving a small red blood cell layer) using sterile tweezers just after removal of PPP and then transferred into a sterile dappen dish [Figure 1]. In Group I patients, PRF gel was carefully placed into the cavity till the entire cavity was filled. In Group II patients, bottom of the defect was filled with PRF with collagen; then, nanocrystalline hydroxyapatite crystals were packed into the defect as a second layer, and finally, PRF was placed as a membrane. In Group III patients, the defect was not replaced with any substitutes. The mucoperiosteal flap was repositioned and simple interrupted sutures were given using 3–0 nonabsorbable black silk suture. Systemic antibiotics (amoxicillin 500 mg, three times a day for 5 days) and analgesics (Rutodyne-D, two times a day for 3 days) were prescribed. The patient was instructed to rinse 0.2% chlorhexidine digluconate for 7 days. The sutures were removed after 7 days. Clinically, the patients were assessed for edema, postoperative pain, signs of infection, untoward reaction, and wound dehiscence. Patients were kept under observations at regular intervals of 3rd and 6th month. During recall visits, surgical site was evaluated clinically as well as radiographically for proper healing of periapical defect. Radiovisiography (RVG) was taken and the image was analyzed using RADIANT DICOM VIEWER, and the results are statistically analyzed using simple contrast test [Figure 2]. A significantly higher rate of healing was observed after 6 months with PRF and NcHA as a graft material in Group II (100%) followed by PRF in Group I (92%) and Group III, where no graft material was added in the curetted periapical defect (86%) [Figure 3], [Figure 4], [Figure 5] and [Table 1], [Table 2], [Table 3], [Table 4], [Table 5], [Table 6]. The percentage of reduction at the end of 6th month for Group I is 92%. [Table 1] shows mean and SD of the area at baseline, 3rd, and 6th month after the intervention of PRF. The purpose of the table is to identify or find out the effectiveness of the intervention with PRF. The mean area of the lesion was found to be 0.68 at baseline reduces to 0.16 at the 3rd month and reduces to 0.05 at the end of 6th month. One-way ANOVA repeated test measures have been applied. The significant P value reveals that the above 3 mean values are statistically different. To find out whether the reduction is significant in the 2 posttest, simple contrast test has been applied. The results are shown in [Table 2]. The significant P value of baseline versus 3rd month and baseline versus 6th month ensures that there is significant reduction in 3rd month and also there is significant reduction at the end of 6th month. The above findings indicate PRF is effective in reducing the size of the lesion. The percentage of reduction at the end of 6th month for Group II is 100%. [Table 3] shows mean and SD of the area at baseline, 3rd, and 6th month after the intervention of PRF and nanocrystalline hydroxyapatite crystals with collagen. The purpose of the table is to identify or find out the effectiveness of the intervention with PRF and nanocrystalline hydroxyapatite crystals with collagen. The mean area of the lesion was found to be 1.22 at baseline reduces to 0.19 at the 3rd month and reduces to 0.0 at the end of 6th month. One-way ANOVA repeated test measures have been applied. The significant P value reveals the above 3 mean values are statistically different. To find out whether the reduction is significant in the 2 posttest, simple contrast test has been applied. The results are shown in [Table 4]. The significant P value of baseline versus 3rd month and baseline versus 6th month ensures that there is significant reduction in 3rd month and also there is significant reduction at the end of 6th month. The above findings indicate PRF with NcHA with collagen is effective in reducing the size of the lesion. The percentage of reduction at the end of 6th month for Group III is 86%. [Table 5] shows mean and SD of the area at baseline, 3rd, and 6th month after the intervention without any graft. The purpose of the table is to identify or find out the effectiveness of the intervention without any graft. The mean area of the lesion was found to be 0.791 at baseline reduces to 0.375 at the 3rd month and reduces to 0.111 at the end of 6th month. One-way ANOVA repeated test measures have been applied. The significant P value reveals the above 3 mean values are statistically different. To find out whether the reduction is significant in the 2 posttest, simple contrast test has been applied. The results are shown in [Table 6]. The significant P value of baseline versus 3rd month and baseline versus 6th month ensures that there is significant reduction in 3rd month and also there is significant reduction at the end of 6th month. The above findings indicate intervention without any graft is effective in reducing the size of the lesion. The result of the present study showed that there was a complete bone regeneration in Group II than Group I and Group III at the end of 6 months. The ultimate goal of periapical surgery is the predictable regeneration of periapical tissues, including the complete repair of the osseous defects. Inadequate bone healing is caused by ingrowth of connective tissue into the bone space, preventing osteogenesis. To prevent this soft-tissue ingrowth, bone grafts can be used to fill the bony space in case of large bony defects. Because with the evidence of early osseous healing, subsequent orthodontic and prosthodontics treatment can be readily performed. Ideal wound healing would achieve maximum regeneration and minimal repair so that the biological function of the injured tissue would not be jeopardized. These effects are obtained with various protocols: the use of bone substitutes, barrier membranes, growth factors, or a combination of such agents and materials. Several compromised clinical situations may be encountered during apical surgery. These include (I) large apical (cystic) lesions, (II) through-and-through (“tunnel”) lesions, and (III) apicomarginal lesions. In small periapical lesions, resident osteoblasts, periodontal ligament cells, and cementoblasts might be capable of restoring damaged periapical tissues. However, in large periapical lesions, periapical wound healing requires recruitment and differentiation of progenitor cells/stem cells into osteoblasts, cementoblasts, and periodontal ligament cells. Andreason and Rud proposed that if the size of the osseous defect is too large, osseous regeneration of the wound will not occur and the defect will heal by fibrous connective tissue repair. Recommended intervention would be to use resorbable nanocrystalline hydroxyapatite with collagen for defect fill or to place resorbable membranes both on buccal and lingual aspects of the tunnel lesion to prevent the ingrowth of soft tissues. In large defects, buccally and lingually placed membranes may collapse toward the defect; therefore, placement of a nonopaque and resorbable filling material (calcium sulfate or NcHA) in the bony crypt is recommended to support nonrigid membranes. Choukroun's PRF, a second-generation platelet concentrate, is an autologous leukocyte and PRF material. This is produced in a natural manner, without adding anticoagulant neither bovine thrombin nor calcium chloride during blood harvest. The absence of anticoagulant implies the activation in a few minutes of most platelets of the blood sample in contact with the tube walls and release of the coagulation cascades. The protocol is very simple and of low cost. PRF is a matrix of autologous fibrin, in which large quantity of platelet and cytokines are embedded intrinsically leading to their progressive release over time(7-11)days, as the network of fibrin disintegrates. In this study, PRF was used in the form of a platelet gel which offers several advantages including promoting wound healing, bone growth and maturation, graft stabilization, wound sealing, and hemostasis and improving the handling properties of graft materials. PRF is a concentrated suspension of the growth factors found in platelets. These growth factors are involved in wound healing and are postulated as promoters of tissue regeneration. PRF is a rich source of platelet-contained growth factor (PDGF), transforming growth factor (TGF), and insulin-like growth factor (IGF). IGF-I stimulates bone formation by proliferation and differentiation, and it is synthesized and secreted by osteoblasts. An increase in the proliferation of human osteoblasts has been demonstrated with a combination of PDGF, IGF-I, TGF, and epidermal growth factor. Preliminary experimental studies have shown that nano-sized ceramics may represent a promising class of bone graft substitutes due to their improved osseointegrative properties. Accordingly, a synthetic NcHA bone graft has been introduced for augmentation procedures in intrabony defects. Advantages of NcHA material are osteoconductivity, bioresorbablity, and close contact. A special feature of nanostructured materials is an extremely high number of molecules on the surface of the material. In this study, combination of NcHA with collagen and PRF is used as it helps in faster bone regeneration and prevents scar tissue formation in case of through-and-through lesion. In our study, RVG was taken preoperatively, 3rd month, and 6th month after surgical intervention. The same image was viewed using RADIANT DICOM VIEWER to assess the surface area, length, and width of the lesion. The DICOM is used in various fields of medicine. Results of this study correlate with Enas Ahmed Elgendy et al. who studied the clinical and radiographic evaluation of NcHA with or without platelet-rich fibrin membrane in the treatment of periodontal intrabony defects and concluded that adjunctive use of PRF membrane in combination with NcHA bone graft produced statistically significant result compared to NcHA bone graft alone. Within the limitations of this study, it has been concluded that Group II (PRF with NcHA) has been demonstrated to be an effective approach to induce faster periapical healing than Group I (PRF) and Group III (no substitutes). The difference noted in bone regeneration could be related either to their growth factors or osteoconductive potential. PRF is used as it helps in better healing and faster regeneration because of the biological modulators and also helps in osteoinduction. Nano-sized hydroxyapatite crystals lead to a significant increase in protein adsorption and osteoblast adhesion on the nano-sized ceramic. However, further studies of PRF with NcHA are necessary with uniform size of lesion and uniform average age groups for better evaluation of healing potential of the grafts used in this study. This study is financially supported by Centrifugal Machine from Department of Biochemistry, RMMCH. Nair PN. Pathogenesis of apical periodontitis and the causes of endodontic failures Crit Rev Oral Biol Med 2004;15:348-81. B. Suresh chandra, V. Gopikrishna. Grossman's Endodontic Practice. 12th ed. India: Wolters Kluwer Health; 2010. Lin L, Chen MY, Ricucci D, Rosenberg PA. Guided tissue regeneration in periapical surgery. J Endod 2010;36:618-25. Chogle SM, Goodis HE. Regenerative endodontics. Dent Clin North Am 2012;56:495-698. Precheur HV. Bone graft materials. Dent Clin North Am 2007;51:729-46, viii. Saluja H, Dehane V, Mahindra U. Platelet-rich fibrin: A second generation platelet concentrate and a new friend of oral and maxillofacial surgeons. Ann Maxillofac Surg 2011;1:53-7. Sreedevi P, Varghese N, Varugheese JM. Prognosis of periapical surgery using bonegrafts: A clinical study. J Conserv Dent 2011;14:68-72.
von Arx T, Alsaeed M. The use of regenerative techniques in apical surgery: A literature review. Saudi Dent J 2011;23:113-27. Tsesis I, Rosen E, Tamse A, Taschieri S, Del Fabbro M. Effect of guided tissue regeneration on the outcome of surgical endodontic treatment: A systematic review and meta-analysis. J Endod 2011;37:1039-45. Bashutski JD, Wang HL. Periodontal and endodontic regeneration. J Endod 2009;35:321-8. Shivashankar VY, Johns DA, Vidyanath S, Sam G. Combination of platelet rich fibrin, hydroxyapatite and PRF membrane in the management of large inflammatory periapical lesion. J Conserv Dent 2013;16:261-4. He L, Lin Y, Hu X, Zhang Y, Wu H. A comparative study of platelet-rich fibrin (PRF) and platelet-rich plasma (PRP) on the effect of proliferation and differentiation of rat osteoblasts in vitro. Oral Surg Oral Med Oral Pathol Oral Radiol Endod 2009;108:707-13. Jayalakshmi KB, Agarwal S, Singh MP, Vishwanath BT, Krishna A, Agrawal R, et al. 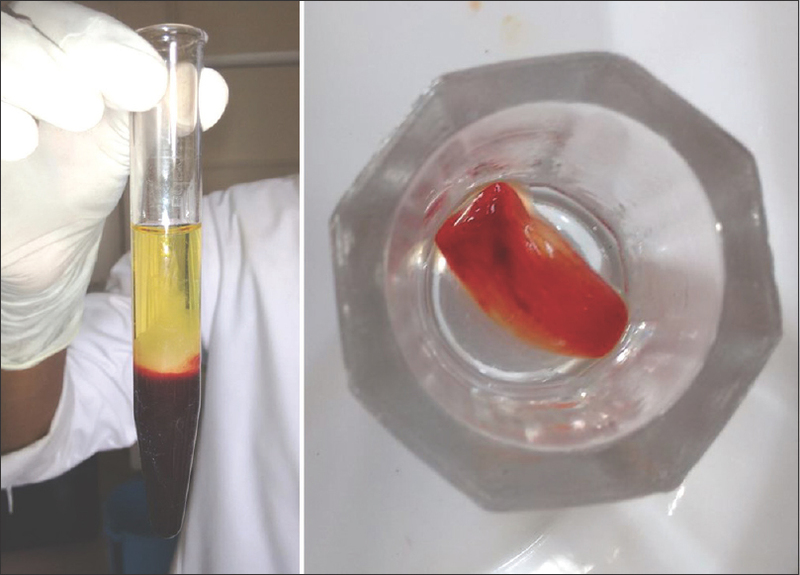 Platelet-rich fibrin with β-tricalcium phosphate-A noval approach for bone augmentation in chronic periapical lesion: A Case report. Case Rep Dent 2012;2012:902858. Shimao Y, Mingguo W, Jing L, Jinpan L, Xialian L, Wei X. The comparison of platelet-rich fîbrin and platelet-rich plasma in releasing of growth factors and their effects on the proliferation and differentiation of adipose tissue-derived stem cells in vitro. Hua Xi Kou Qiang Yi Xue Za Zhi 2012;30:6. Singh S, Singh A, Singh S, Singh R. Application of PRF in surgical management of periapical lesions. Natl J Maxillofac Surg 2013;4:94-9. Elgendy EA, Abo Shady TE. Clinical and radiographic evaluation of nanocrystalline hydroxyapatite with or without platelet-rich fibrin membrane in the treatment of periodontal intrabony defects. J Indian Soc Periodontol 2015;19:61-5.